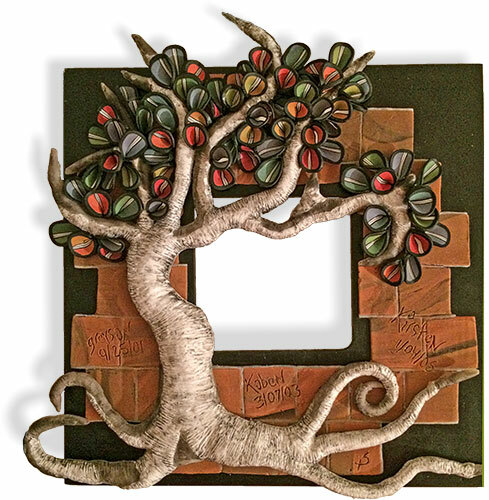 Stephanie, one of the students in the Ohio Reformatory for Women polymer class created this lovely frame for the exhibit, Reflections from a Gated Community: Art from Ohio Inmates that opens at our local (High Road Gallery) gallery this Sunday. Reception from 2-4. The black 10″ square wood frames were made by my husband and the inmates could decorate them with polymer however they wished. Because we can’t take glass into the prison, the mirror was added last. This frame is called Appreciating Life. The inmates have no internet available for tutorials, Pinterest and PCDaily.They have no tissue blades, nothing sharp, no fancy tools. They rely on books, occasional classes and their own creativity. Still their art is raw, powerful and full of conceptual content and personal meaning. In each class, I teach them techniques and they teach me about art and life. I wondered why Lindly Haunani was sending PCD so many good links this month. Turns out she’s been convalescing and spending more time than usual online. She’s on the mend after quite a long siege but I know she’d like to hear from you all. Lindly will recognize that Stephanie’s been studying her color book! Appreciating Life, indeed. Wow. That is wonderful. The design of the blocks and tree, placement, and coloring all work together to make a stunning piece. This is indeed an impressive piece. The artist should be very proud, as should you for guiding her and the others. It’s interesting to see the intricate completeness of a piece done without the assistance of tools. there is life and goodness after all, i am very pleased to see. Thanks for the uplifting post about the experience you are having at the Ohio Reformatory for Women. And a big hug to Lindy and wishes for a speedy recovery. I was blown away with this! The artist has done something with her hands that I can’t even do with all my tools! And I too was deeply touched by her brick work. Wishing Lindly a happy recovery! A very touching and charming piece. The healing power of art always astonishes and uplifts me. Thank you for sharing your experiences, Cynthia. You’ve redirected my day! I am Very proud to hear that someone reached out to women who are incarcerated and not only bring art into their lives as well as a change in their routine. I love this one! I think the world would be happier if everyone found their creative place within. The women are making so much progress, I am amazed at their level of skill. You are giving them a great gift, and I know it is rewarding for you too. I attended this grand opening at the Gallery in Worthington and the photos are beautiful, but to see art work in person was awe inspiring. It is wonderful the work that Cynthia and Jackie Burns volunteer to these women. What it does for these women is so meaningful that it is hard for me to describe. I know of what I speak. I met Cynthia and Jackie at the Gallery and it was very heartwarming.